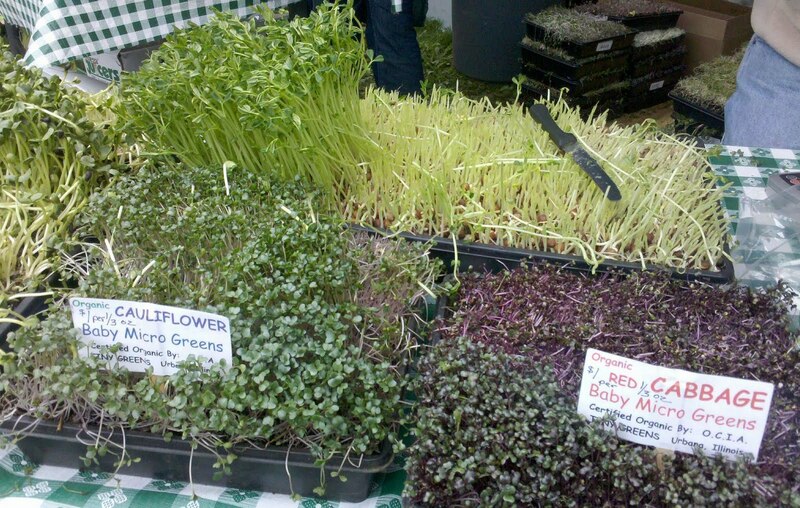 Green City Farmers Market in Chicago offers a bevy of succulent fruits and vegetables; it also offers a place that will annoy the crap out you! It's the place to be and be seen... it's the place to dodge double wide strollers, dogs and people walking their bikes (rather than locking them up outside of the event.) Oh, and did I mention it's the place to push, shove and cut in line just to get a teeny tiny sample of cheese that barely fits on the end of a sharp toothpick? All that aside, there are a few good reasons to go. 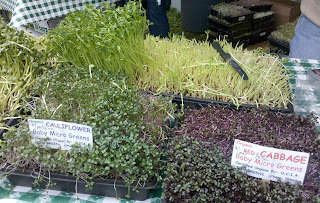 Today's good reason was micro greens; those cute little baby plants that pack a killer amount of flavor. I picked up a mixture of four: cabbage, pea shoots, radish, cauliflower; each lending their own crunchy flavor to entice your tongue. A great substitute for lettuce in wraps or in a spring roll, but equally amazing mixed as a salad. Don't be afraid to ask for tasting and choose the ones that you like best. One ounce of the pea shoots and a mere one third of an ounce of the littlest baby greens gave me enough to create 2 large salads; easily enough for 4 as a light starter or side. Ultimately, there are times when annoyance is worth it- this was one of those days. This recipe is also my shout out to the Weight Loss Challengers at Gozamos. Seems I've been tempting them with some of my not-so-skinny recipes like the unbelievably yummy Choco Taco. This super delicious and healthy salad will help keep you on your path.... just don't expect these kinds of healthy recipes too often, after all, it the Fat and Happy Blog! Tips and techniques: If you can't find micro greens, simply substitute other lettuce. I've done it previously and the flavor is still quite wonderful, it's just not as exotic. Go heavy on the pepper; it plays well with the honey and lemon. Toast the sliced almonds in a dry pan, careful not to burn them. Add in the sesame seeds a few minutes before the almonds are finished toasted, set aside. 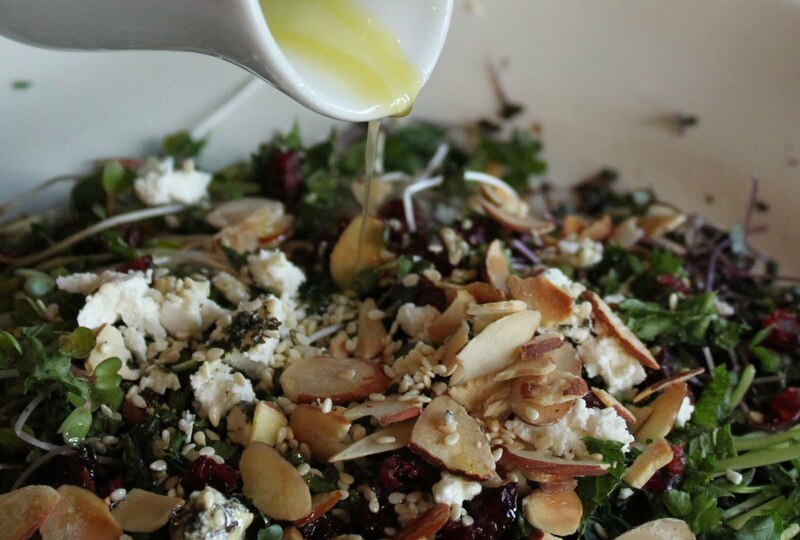 Make vinaigrette (below). 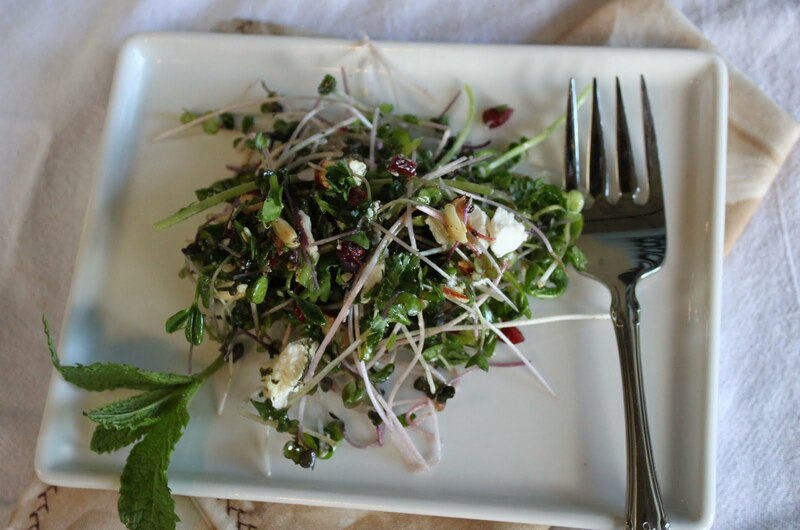 Combine the micro greens with the chopped cherries, basil, mint and toasted nuts; add fresh ground black pepper. Drizzle a few tablespoons of the lemon vinaigrette over the salad, toss lightly. Crumble the goat cheese on top with a light hand; you only need a few small crumbles or it will overwhelm the salad. Taste, add more dressing and pepper if needed. Add the ingredients together, warm just slightly for 20 seconds in the microwave and whisk together. Serve slightly warmed. I love having microgreens on my salad, especially if I grew them myself.